Finding the right mouse can prove both difficult and risky. It takes time to adjust to the feeling of a new mouse in your hand. The wrong mouse, especially one that is too big or bulky, may even cause pain and discomfort after hours of gaming. Many cheaper mice tend to experience software issues or lag on the screen during gaming, and wireless mice are notoriously problematic in gaming situations due to the need for constant charging and a line-of-sight with the USB connector. Finding a good mouse at lower price becomes daunting. Many gamers decide to spend big bucks in order to avoid the issues associated with mice at the lower price range. This may not be an option for everyone who prefers to spend their time playing games on a high-performance laptop. More expensive mice will still demonstrate wear and tear, and a mouse the wrong size or shape may prove costly if it cannot be returned. Buying a cheaper mouse may reduce replacement costs over time and prove less risky than buying a more expensive mouse. While many gamers choose expensive mice that excel in performance and durability, others look for cost-effectiveness, getting more bang for their buck. We have discovered the five best gaming mice under $50, choosing one that outperforms the rest. If you are interested in cost-effective laptop gaming, here is a list of the five best gaming laptops under $500. We determined this final list by combing through the rankings for hundreds of gaming mice looking for both affordability and excellent reviews. We looked at various performance, comfort, and aesthetic features in order to determine the very best gaming mouse under $50. Interviews with both experienced gamers and relatively newer users helped us find the very best, most affordable mouse. We also considered customer reviews on a variety of websites and researched the small details that are important to gamers. After hours of searching and interviewing, we narrowed the list to the five best gaming mice under $50, then determined exactly which mouse outperforms the rest. Size and shape must be considered above all else when searching for a mouse. An ergonomic design that fits your grip should be your first priority. If the mouse does not fit, the result could be pain and discomfort after hours of use. Any new mouse will take time to adjust to, but if you understand your grip type, then it will become much easier to find one that you will be able to grow to love. A comfortable mouse means more time focused on the game before a hand begins to cramp. In looking for any mouse, the user’s grip should be taken into account. Palm-grip users prefer high-arched mice, while fingertip-gripped gamers find low-arched mice more comfortable. Claw-grip users look for a medium arch somewhere between the heights preferred by other grips. We focused on medium sized mice with medium arches to fit a broad range of grips. Claw grips will find these mice most comfortable, but palm and fingertip gripped users should be able to use the mice effectively as well. DPI, or dots per inch, determines the sensitivity of the mouse. Gamers who move the mouse with their wrist and hand may want a more sensitive mouse, while those who use their entire arm may want a less sensitive one. Most gamers prefer a mouse with a minimum of 4,000 DPI. We focused on gaming mice that are either adjustable or have medium to high sensitivity. Most of the mice on this list can be adjusted high or low depending on the user’s preference. Gaming mice must endure a lot of abuse, so they need to be tough. After millions of clicks, the mice often fail, creating issues with double-clicking or nonfunctioning buttons. 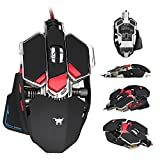 A good gaming mouse should operate effectively six months to a year after purchase. Durability became one of the biggest determining factors in selecting these rankings. One mouse in the list is considered amongst the best in the world, but it loses points for its fragility over time. In our research, we discovered that mice with Omron switches tended to prove more durable, often lasting close to or over a year. The weight of the mouse helps to determine the ease of movement. A heavier mouse will prove effective for palm grips, and a lighter mouse should be used with fingertip grips. Since most of the mice on this list are in a cheaper category, few have adjustable weights. Lighter mice tend to be ranked higher due to their ease of use. A heavy mouse will not glide as easily on a variety of surfaces. The polling rate of a mouse measures how often the mouse reports its position to the computer. Depending on software, a lower polling rate will cause lags in the mouse’s movement on the screen. Some mice now have adjustable polling rates. A polling rate of 500 Hz means that the mouse reports its position every two milliseconds. 1000 Hz has become the standard of most mice. The #1 pick is the Corsair Gaming Sabre RGB Gaming Mouse. This lightweight gaming mouse’s ergonomic design comfortably fits all grip types while reducing lagging with its 1,000 Hz polling rate. The Corsair includes eight programmable buttons and an optical sensor, the color of which may be customized. The RGB lighting is also customizable, providing a wonderful aesthetic quality to the mouse in over 16.8 million possible colors. The 10,000 DPI mouse may be adjusted to the user’s preference. Other adjustable features include lift height, angle snapping, pointer speed, and enhanced pointer precision. The segmented scroll wheel provides smooth, seamless scrolling with a nice, solid click. The rubber wheel maintains comfortability and responsiveness. The Corsair is easily the most customizable mouse on this list due to the CUE software and downloadable options. The high performance Omron switches ensure durability and should last beyond 20 million clicks. The mouse only weighs 3.2 oz., making it easy to maneuver across any surface. Overall, in terms of cost-effectiveness, durability, and comfort, the Corsair Gaming Sabre is the absolute best value for a gaming mouse under $50. The Razer DeathAdder Chroma serves as the cheapest member of a DeathAdder line that is recommended by gamers across the world. Its ergonomic design fits a broad range of grips, making its comfortable for most users, though gamers with palm grips will find it most pleasant. The Chroma’s 1,000 Hz ultrapolling makes lagging virtually nonexistent, and the DPI adjusts up to 10,000. The Razer Synapse program permits customization of the settings, and the sensitivity may be turned off when not gaming in order to prevent the constant consumption of RAM. The customizable lighting option can create up to 16.8 million color options. The optical sensor also tracks the z-axis and is capable of cutting off as low as 1 mm off the surface that it is tracking. At 3.7 oz., the Chroma only slightly outweighs the Corsair and allows for easy maneuvering across any surface. The biggest downside to the Razer DeathAdder seems to be durability. Many users report them to become ineffective or broke just after months of use. Double-clicking issues or non-working buttons begin occurring within the first six months. The DeathAdder often appears in the conversation for best gaming mouse, but its questionable durability places it below the Corsair. The UtechSmart Venus was built with experienced gamers in mind. Its 18 programmable buttons do not interfere with its smooth, contour design. The rubber painted surface helps ensure a solid grip during gameplay. The Venus’s 1,000 Hz polling rate and optical sensor with an adjustable 16,400 DPI effectively eliminates most lagging, while the 6 ft. braided fiber cable and gold-plated USB connector ensure connectivity. The mouse features weight and balance tuning to appeal to a wider range of users. The eight 2.4 g weights help users to fine tune the weight of the mouse to their liking. The RGB lighting provides up to 16 million color options with an option to disable the lighting altogether. Some users report that the lighting is subpar compared to other gaming mice. The Omron switches ensure firm clicks, and most gamers find the device extremely durable. Some users report the Venus as operating like new a year after purchase. The mouse weighs 7.2 oz., but its Teflon feet pads ensure easy gliding across the surface. The mouse, while ergonomically designed, arches high compared to other mice, making it uncomfortable for many users. Its programming is also more complex than other mice, so newer users may find issues customizing the performance and light features. While a frontrunner for the best gaming mouse, it comfortability and user friendliness does not match up with the Corsair. The Logitech G602 is the only wireless mouse on this list due to its 250-hour battery life. The USB range extender prevents the mouse from requiring strict line-of-sight for proper connectivity. The G602’s ergonomic design with textured grip on both sides ensures comfort for hours of gameplay. The addition of batteries does not make the mouse too heavy for most gamers, but it does weigh the mouse down more than others on this list. The mouse will operate on one battery, allowing for some reduction in the weight. The Logitech’s 5 DPI settings range from 250 to 2,500, while the 500 Hz polling rate is a lower than others presented here. A meter on mouse measures the remaining battery life, and the software updates the user through messaging on the computer when the mouse hits 5% battery life. While the Logitech G602 certainly beats out any other wireless mouse on the market, it cannot compete with the DPI, polling rate, and weight of wired mice on the list. The Combaterwing Gaming Mouse’s design makes it the coolest looking mouse on this list. Its aluminum base and ergonomic design makes it perfect for claw-grip users. The Combaterwing’s adjustable 4800 DPI helps reduce lagging and permits gamers to cycle through four user-determined settings. The Omron switches ensure durability up to 10 million clicks. The biggest draw for the Combaterwing is its look. The RGB lighting combines with the design to give it a futuristic aesthetic. The ten programmable buttons do not detract from the look or feel of the mouse. The Combaterwing weighs 5.4 oz., placing it in the middle range of weight for mice on this list. The Combaterwing ultimately suffers from software issues that detract from the overall use. The mouse must be disconnected from the USB port and reconnected often. While it is comfortable for claw-grip gamers, it does not appeal to a wide range of grips, leaving it at the bottom of the list. The Combaterwing is the cheapest mouse on the list as well as the most visually stunning, but software issues and comfortability leave it at the bottom. A good gaming mouse must be comfortable in the user’s hand, durable, have a high DPI and polling rate, and a balanced, lighter weight. For this reason, the Corsair Gaming Sabre RGB Gaming Mouse sits atop the list. Though several mice on this list nip on the Corsair’s heel, they cannot match its comfortability. Its size and shape make it ideal for gaming on a laptop. The Corsair’s adjustable high-sensitivity DPI and excellent polling rate virtually eliminate lagging, and its highly customizable performance and lighting features put it at the top. The Corsair’s durability keeps it there. All of the mice on this list are significantly more cost-effective and reliable compared to others on the market, but the Corsair Gaming Sabre combines comfortability, DPI, polling rate, weight, and durability in manner that outshines the rest. Finding the Best Gaming Mouse under $50 can be hard, which is why we've done the work for you and narrowed down 5 great budget options for you.